The nave is C12 and the chancel C13. In 1854 both were thoroughly restored and a south aisle was added. The C18 monuments are good. The parish of Streat is long and narrow, extending northwards from the edge of the Downs, and takes its name from the Roman road from outside Pulborough to near Lewes that ran north of the church (Glover p160). This is by the early C17 Streat Place, home of the Fitzhugh family. 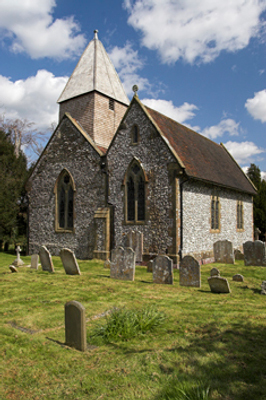 Domesday Book mentions two small churches (12, 40), but it is doubtful if any part of the present building belongs to either. The Burrell Collection drawing (c1780) shows an aisleless nave with a blocked round-headed south doorway and a small window, which look earlier C12 and Hussey describes a north doorway similar to the south one (p293). On the Sharpe Collection drawing of 1802 the south window appears enlarged, but its high position in the wall looks original. The detail in the north wall is C19, though it is at least partly old. On the Burrell drawing a big south lancet in the chancel is evidence of C13 work, though the form of the east end as built is not known, save that there was a blocked lowside which Hussey noted (ibid) and which would also be consistent with a C13 dating. C14 features included single-light west and south windows with trefoiled heads under square hoodmoulds, but none remains. The C19 replacement west window has two lights and its curious double rere-arch shows the west wall has been thickened, probably in the C16 to support a belfry. This is little changed and is disproportionately large. Early in the C17 the Fitzhughs added a brick north chapel to the chancel, which an engraving dated 1797 in The Gentleman’s Magazine (1804 part II opp. p1181) shows with a square-headed east window. 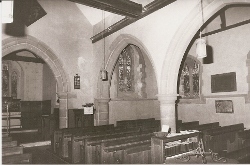 The chancel was apparently restored in the 1840s (BE(E) p630), though there are no further details. More certainly, in 1854 a gabled south aisle was added with detail of around 1300 (WSRO Ep II/27/237), including the arcade and the new chancel arch is said to date from then (the date of any predecessor is unknown). 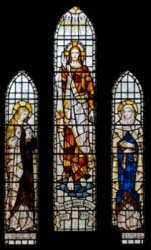 Much else was replaced without regard to what had been there before; thus, in place of the south lancet of the chancel is a single-light window like the former west one, though perversely the latter now has two-lights. There was a new north doorway and window, with a masonry porch. 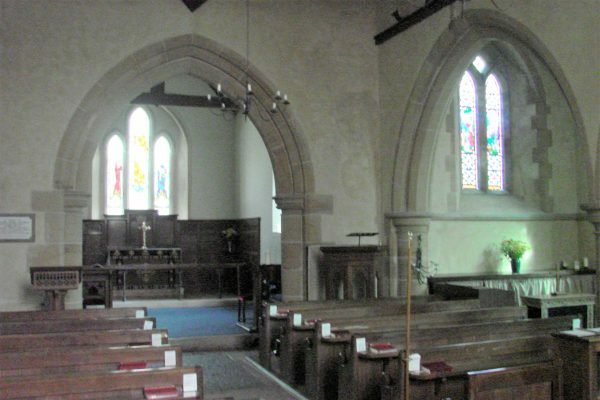 The east triplet was inserted with a shafted rere-arch and all roofs were renewed. A trefoil-headed recess on the north side looks C19, but may recall earlier work. No architect’s name is associated with such destruction, but in 1882 E E Scott replaced the Fitzhugh chapel with a large vestry (WSRO Ep II/27/238) and his known dates would have permitted him to do the earlier work as well. Little is known about his activities in Sussex in the mid-1850s, but the hard flint walls and cavalier changes recall the restoration of Albourne, West Sussex (1859), for which he may also have been responsible. Font: C19 with a square bowl with chamfered corners on a shafted pedestal. 1. 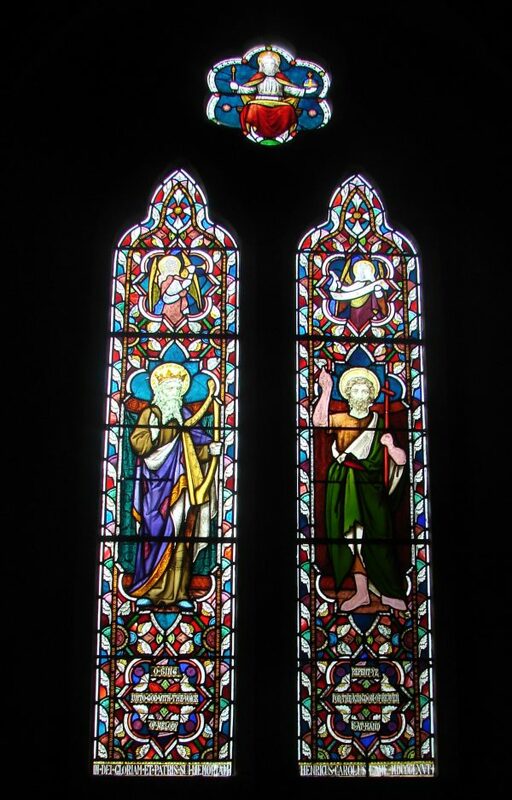 (West window) Ward and Hughes, 1866 (www.stainedglassrecords.org retrieved on 29/3/2013). 2. (South chancel) Reset glass by J Powell and Sons, 1853 (Order book). This is brightly coloured and set in greenish glass, but is worn. 3. (South aisle, east window) J Powell and Sons, 1864 (ibid). Though still anonymous, the condition of this is far superior than the last, indicating the technical advances in glass-making during the intervening period. 4. (North vestry/Fitzhugh Chapel) Heraldic glass by C E Kempe, 1882.
and very hard to distinguish from the work of C E Kempe, of whom Bryans was a close associate. 6. 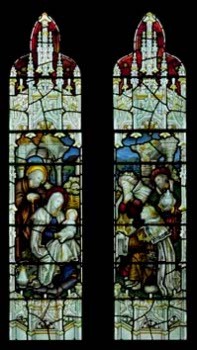 (South aisle, west window) Signed by H Bryans, 1911 (CDG 214 (1911) p206), but actually designed by E Heasman (Little (ed) p64). The closeness to contemporary work by Kempe and Co is striking. 7. (Opening above west window) H Bryans, undated (www.stainedglassrecords.org retrieved on 29/3/2013). 8. (East window) J Powell and Sons, c1935 designed by A F Erridge (Hadley index). 9. (North nave, first window) H Powell, 1969 (WSRO Fac). Lectern: R Thompson of Kilburn, with his signature of a mouse and an openwork top. 1. (Nave floor) Iron tomb-slabs, one to members of the Gott family (d between 1732 and 1754), said to be the largest of its kind, and the other to Sarah Saunders (d1731). 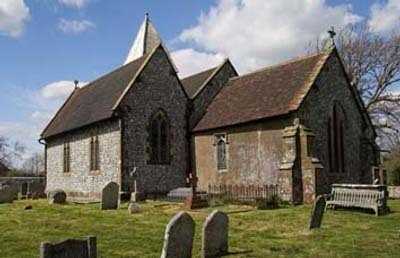 This church is the furthest west in the county with iron slabs, presumably because Sarah Saunders’s family came from Wadhurst and had links with Lamberhurst, Kent, where the slabs were made (3 p108). 2. (North wall of nave) William (d1752) and Mary Dobell (d1764). These are an obvious pair. The coloured marble backgrounds and decorative work around the inscriptions, relieved only by cherubs, suggest London workmanship, though Roscoe does not follow an attribution in the church to Sir H Cheere. 3 and 4. (Churchyard) J Skelton (d1999) and his daughter Rebecca (d2005). Both carved by Skelton’s daughter Helen Mary (2 p53). Paintings: Remnants of C19 stencilling, probably done in 1854, in the chancel. Royal Arms: (Above chancel arch) Charles II (though just stated to be those of ‘CR’), dated 1660. They are painted on a lozenge-shaped panel. My thanks to Nick Wiseman for the photographs except the Dobell monument and the west end. He also drew my attention to the Royal Arms.